Distorter Gun: Seeker's Distorter gun causes material objects to crystallize. Universal Control Rod: The Universal Control Rod emits blasts of energy and doubles as a one-man flying conveyance. Inter-City Scanner: Seeker carries a highly advanced tracking device. 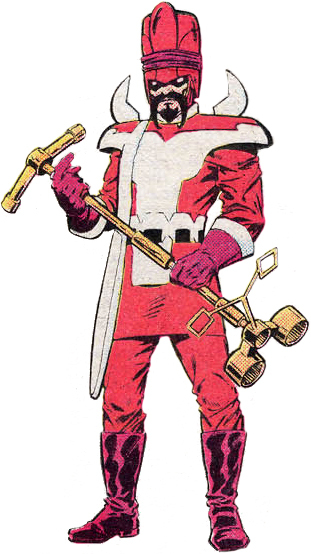 Seeker is a member of The Inhumans, they are a race of beings that split from the human race 25, 000 years ago after the alien race called the Kree began to experiment on Earth's then-primitive Homo sapiens to produce the genetically advanced Inhuman race.. Although their experiments were successful in creating a strain of humanity with extraordinary abilities. the Kree abandoned their experiment because a genetic prophecy had predicted that the experiments would eventually lead to an anomaly who would destroy the Kree Supreme Intelligence.. When the Kree left the Inhumans were left on Earth. Their test subjects, the Inhumans, went on to form a society of their own, which thrived in seclusion from the rest of humanity and developed advanced technology. Experiments with the mutagenic Terrigen Mist (a process known as Terrigenesis) gave them various powers, but caused lasting genetic damage and deformities.